With little fanfare or widespread media attention outside of Indiana, Carbon Motors filed for bankruptcy on June 7. It would seem that the saga of their purpose-built police cars with powerful BMW diesel engines has finally come to a sad and ignominious end. The last we had heard from Carbon Motors, they had just sort of up and left their Connersville, Indiana car plant back in April. The Indianapolis Business Journal reports that earlier this month the company filed for Chapter 7 bankruptcy protection, listing liabilities of $21.7 million and assets of just $18,976. The assets consist of a prototype police car, miscellaneous furniture, books and records, and the company’s intellectual property, said Henry Efroymson, a partner at Ice Miller LLP, who is representing the company. Much of the liabilities listed in the bankruptcy are claims from investors who had sunk millions of dollars into the company. Among the biggest claims: $3.6 million from Chicago billionaire Joe Mansueto, the founder and CEO of investment research firm Morningstar Inc.
Other debtors include German car company BMW and Troy, Mich.-based Inteva Products LLC, both suppliers to Carbon Motors, who claim they are owed more than $3 million between them. It's a pathetic end for Carbon, which had one of the better ideas among startup car companies in the last few years: the E7, a cruiser built from the ground up for police duty, without the compromises that officers must deal with when outfitting existing cars like a Ford Crown Victoria or a Dodge Charger for patrol. Carbon blamed their troubles in part on getting turned down last year for a $310 million loan they sought from the U.S. Department of Energy, a loan they said they were led to believe would be approved. Like most of the companies who applied for those loans, Carbon is now officially dead. 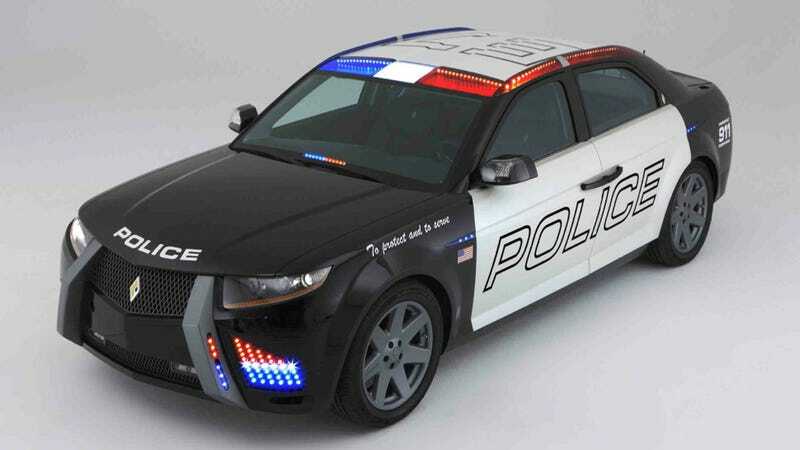 However, as great as Carbon's idea was, it's hard to imagine such an exotic vehicle being feasible and cost effective with small police departments, as Jason noted when he wrote about them in April. And there are some questions about Carbon's business model that should have been asked as well. As David Hester writes in The Truth About Cars, "the company’s business plan seemed to revolve around borrowing money from the government to build cars that they would then sell exclusively to the government." Connersville became a contender for the plant after then-Gov. Mitch Daniels appealed to friend Tom Ridge, who was on Carbon Motors’ board of directors. The two men had worked together in President George W. Bush’s administration, where Daniels was budget chief and Ridge was Homeland Security director. In May 2009, Daniels accompanied Li on a site visit to Connersville. More than 7,000 people attended a rally to show their support. Billboards and business marquees welcomed the company. Given what we've seen with other startup carmakers in recent years, that kind of thing doesn't surprise me at all. In the meantime, it's the people of Connersville and Indiana who will be left high and dry in the wake of Carbon's demise. Hat tip to Victorious Secret in Oppo!